On the morning of October 15th, 2009 a balloon took to the Denver skies and flew into the hearts of a nation desperately in need of hope and inspiration. 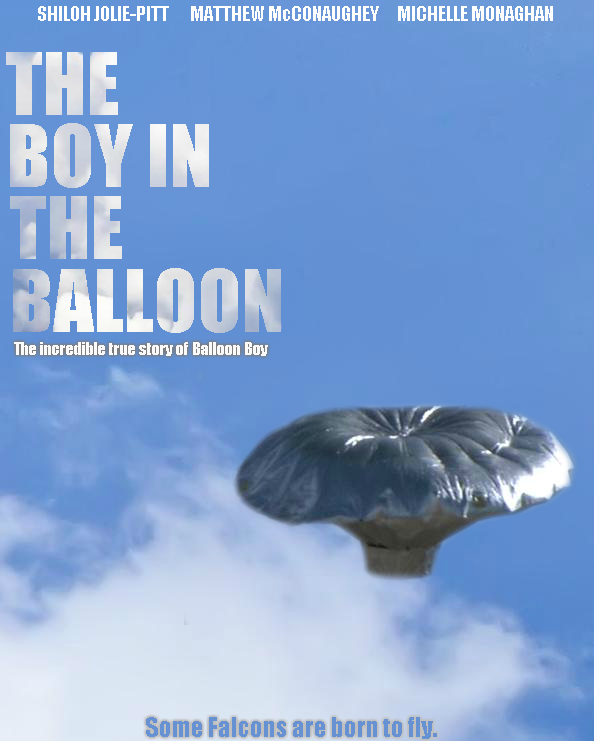 While the helium-filled UFO-shaped balloon reached heights of over 7,000 feet and soared more than 50 miles over the clear blue Colorado skies, the country turned on their televisions and soon learned a shocking twist: a boy was in the balloon. Fearing the worst, authorities frantically attempted one rescue mission after another, each try less successful than the last. The national news media covered the story with bated breath as the nation was introduced to its newest hero: 6 year old Falcon Heene (Shiloh Jolie-Pitt). Falcon, we soon learned, was an adventurous spirit born to a family of storm-chasers and alien hunters. The sweet boy who took flight in the balloon on that fateful day was a representation of all of us: The desire to escape; the will to dream of things never seen or done before; the heart and courage of freedom. After an hour-long flight during which there was no sign of Falcon, the balloon finally touched down and authorities feared the worst. However, as paramedics rushed to the scene they discovered that Falcon was nowhere to be found. The flight of Balloon Boy had ended. But the mystery had only just begun. In the aftermath of what soon became known as the Balloon Boy Hoax, there were questions to be answered. Chief among them, what role did Falcon’s desperate-for-the-spotlight parents Richard (Matthew McConaughey) and Mayumi (Michelle Monaghan) play in the ruse? Why did Falcon vomit in his father’s lap while being interviewed on national television? Could a nation ever forgive the boy who fooled us into realizing that we are destined for greatness? Could we, as a country, ever come to terms with the fact that even though Falcon Heene was not actually up in the balloon on that beautiful October morning in the Mile High City, the example he set would lift us collectively up higher than the clouds? The Boy in the Balloon is a story of the child inside all of us. Experience the pain as Larimer County Sherriff Jim Alderden (Josh Lucas) slowly puts the puzzle together that reveals the truth behind the flight. Relive the trauma of a child being led to deceive the entire world by his parents. And experience the redemption that can only come when a nation learns what it is to dream again…and to forgive those who had to deceive in order to lead them to that realization. The Boy in the Balloon is the heart-warming true story of Falcon Heene, The Balloon Boy, young adventurer with a heart of gold who came of age and brought the entire country along with him on his journey. While your tears will undoubtedly fall, the Boy in the Balloon will let your spirits soar. Doesn’t sound terrible, but you do realize Shiloh Jolie-Pitt is a girl, right? This story disgusts me top to btotom. It smacks of leaky CIA tactics. Considering they already are networked from an ABC program, they are cannon fodder. Have fun with those MKids! gaame iss played both by amateurs and specialists.